We arrived at nimrod in time for breakfast beers, was this to set the pattern for things to come? Foolishly allowed Benny to select a play list which consisted of Kenny Rogers! Thank god for Jo and Liz’s Ibiza mix. Enjoyed a lazy afternoon familiarising ourselves with our setting. Sampled cocktails and lobsters that bit back in the old town. There were reports of locals and other tourists being attacked by flying lobster shell! Started early (12.30) in anticipation of turquoise sea and sandy cove. 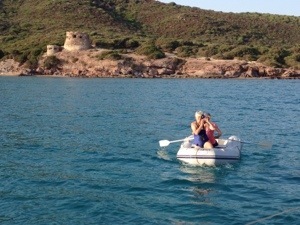 Wind was lacking but sun was high so motored over to Porto conte. Spent the evening swimming in lovely bay shared with some local mullet and star fish. Beautiful BBQ meat feast accompanied by local ravers till 6am. After a trip to the local market we managed to get the sails up (for 30mins as wind wasn’t in our favour) and impress skipper with our race team potential! Sailed passed the fabulous Neptune grotto and honey combed cliffs. Trip made extra special by sharing the seas with two dolphins. Porto Ferro didn’t disappoint, yet more turquoise sea and sweeping beaches but this time with a back drop of old look out towers and a few naked gay boys. 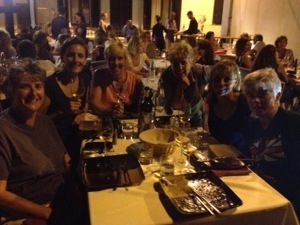 Swimming and lilo fun had by all although Liz Wall is still mourning the loss of her €2 toy(!) The evening continued with beers, a feast of cous cous and hammock swinging. 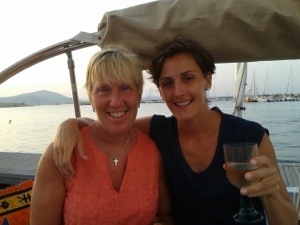 Unfortunately, the peace was broken at 2am when the swell became too much and Jo announced to her crew “that’s it, we’re moving” and a night sail ensured. 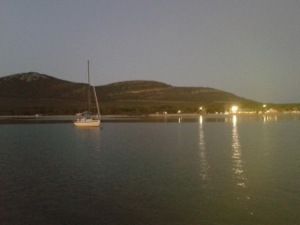 We arrived back at Porto Conte and the local rave at 5.30am ready for our beauty sleep. Once again a lovely breakfast enjoyed on deck in the beautiful sunshine. 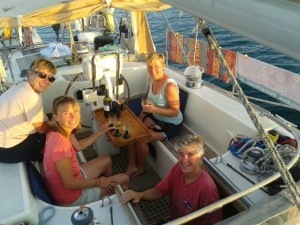 Had to hoist Liz Wall up the mast to stop her running off to the local beach bar disco! Meanwhile, we spent our time diving to take a look at the fish, giant clam and retrieving various objects! (Sorry about your camera lens Ali!). Had ten knots of wind so were looking forward to a sail again, but sadly after raising the sail wind dropped to 4 – So once again the team were thwarted at being able to show their great racing team potential. 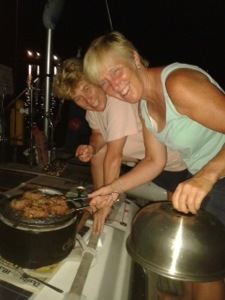 Pictures below of our time on Nimrod including BBQ, beach fun, eating out and beautiful sunset. 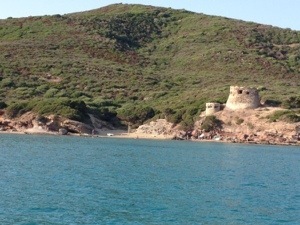 This entry was posted in News and tagged 2013, Italy, Med, Sardinia. Bookmark the permalink. Looks Like everyone had a great time…..